The Short Version: When she coaches singles, Jess McCann wants to be more than a mentor; she wants to be a friend. Her down-to-earth approach to dating coaching has earned her the trust of people around the world. In personalized coaching sessions, Jess seeks to understand her clients’ dating mistakes so she can teach them how to fix what’s going wrong and get into a relationship that lasts. As an authoritative dating expert, Jess has written comprehensive self-help books about the strategies and tactics modern daters need to be successful. Whether you’re wondering what to say in a text message or how to keep the romance alive in a relationship, Jess offers heartfelt guidance based on years of experience coaching clients to become their best selves. Jess McCann is an inspirational and supportive figure in the dating world. Women come to her saying “I feel cursed” and come away knowing what’s going wrong and how to change their sad stories into a happily-ever-after. “I’m like an aunt, not a mommy,” Jess said. “I don’t sugarcoat the truth.” Based in Washington, DC, Jess provides thoughtful dating coaching in person, over the phone or Facetime, and via email. 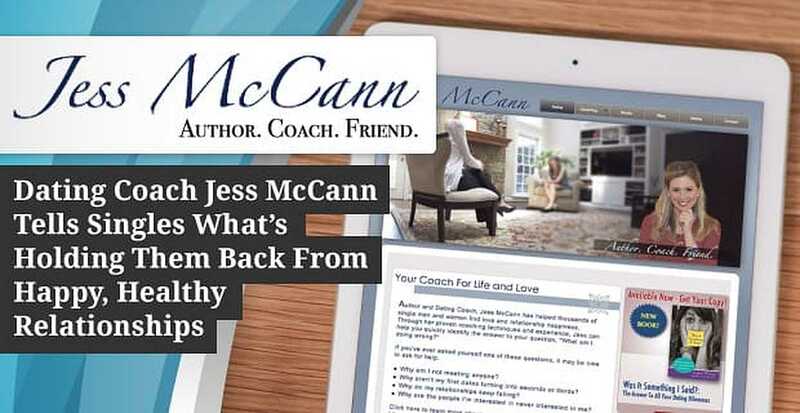 Jess McCann is a sought-after dating coach and author skilled at getting to the root of dating issues. 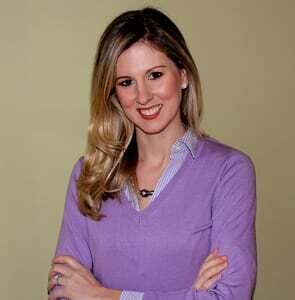 In recent years, Jess has focused more on email coaching to offer singles accessible dating advice on the go. This unique service is ideal for quick dating maintenance or a specific relationship question. Anyone experiencing uncertainty in the dating realm can send an email and get an expert 800-word answer within one or two days. Jess charges $39 per email or $149 for a package of five emails. If you’d rather have a conversation in person or via phone or Facetime, you can hire Jess on for $125 per hour. She also offers an affordable package of three coaching sessions for $310. The dating coach aims to supply a variety of options and price points to help singles get the help they need without delay. Everyone daydreams about that perfect love story, but some people find it difficult to achieve in the real world. When singles feel at a loss about what’s going awry in their relationships, they can turn to Jess to set them straight. Through personalized coaching sessions, Jess truly listens to her clients as they tell her their stories and provides actionable solutions to their dating woes. Jess’ clients range in age from 24 to 69 and come from all walks of life. Whatever challenges they face, the dating coach empathetically counsels her clients on how to get their love lives back on track and find happiness in their particular stage of life. People from vastly different professions — reporters, bartenders, patent lawyers, psychotherapists, and even a marriage counselor — trust Jess to help them out in the love department. Jess offers in-depth email exchanges and phone sessions to support singles struggling in love. Jess works face-to-face with men and women in Washington, DC, but she also uses Facetime and email to connect with singles abroad. She schedules sessions as needed, so an individual could decide to come in regularly each week or every once in awhile for a tuneup. Her walk-in clients typically seek answers for a specific issue while her regulars hope for more overarching guidance in dating and life. In the initial meeting, Jess has her clients write down their entire dating history so she can identify their past mistakes. Once she diagnoses what’s gone wrong, she offers specific remedies and supports their efforts to change and grow. Her advice helps singles learn successful dating techniques and break the negative relationship patterns of the past. Jess has written two self-help books that expand upon common dating errors she sees in her coaching practice. They’re must-reads for singles in all kinds of dating quandaries. In each chapter, the dating coach recommends proven methods to finding and keeping the right partner. If you want to build your relationship skills on your own time, these books are excellent resources. In “Was It Something I Said?” Jess empowers readers to find the dating answers they need. 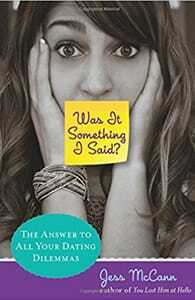 Published in 2013, “Was It Something I Said?” is a comprehensive guide for daters unsure about what to say and how to act in any dating situation. Jess described the book as a choose-your-own-adventure book for love. In it, the dating expert answers the questions of daters in specific scenarios. From turning a friendship into something more to rekindling the romance with an ex, Jess provides word-for-word advice to help readers handle the small issues that can make or break their relationships. With “You Lost Me at Hello,” Jess wanted to give readers more subtle strategies to becoming irresistible to date prospects. She outlines effective techniques, like leaving a date wanting more and creating a sense of urgency, to get daters to commit and close the deal. Her goal is to help singles take actions that will quickly yield good results for their love lives. Jess’ next book, titled “The Curse,” will delve into the issues facing longtime singles who feel cursed and hopeless in the dating world. Jess supports and encourages daters who think love will never happen for them. According the dating expert, love can happen for anyone as long as they commit to doing the work and learning the skills to make it happen. Celene, a single woman living in Alexandria, Virginia, heard about Jess through a Meetup group and bought her book “to see what the hoopla was about.” After reading the book in one sitting, Celene felt this was someone who got it, a dating authority she could trust, so she contacted Jess for online dating help. Within Celene’s first five days of setting up a dating profile, she received messages from over 75 men and credited Jess for the advice that set her on such a fruitful venture. Jess goes the distance to uplift and advise her clients in impactful coaching sessions. Hers isn’t a surface-level approach but an in-depth assessment of the underlying issues in dating. She wants her clients to have lasting, meaningful success in the love department, and sometimes that means overhauling their dating habits. Whether she’s advising singles about when to text a date or sharing emotional insights on breaking harmful dating patterns, Jess provides concrete and personalized solutions for daters around the world.